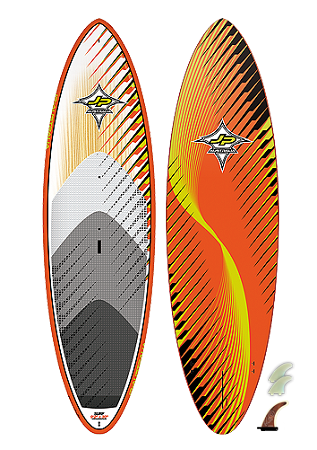 The whole range is based on radical surf board designs adapted and adjusted for the needs of SUP. Each size has a specific bottom shape concept suited to the size.They are equipped with a narrower nose section, higher entry and extra rocker for real surf board feeling. The more pulled-in pointy nose section does not limit therider in radical bottom turns as its combination with the fast scoop rocker line develops heaps of drive. Thin smooth rails slice effortless through the water surfaceand provide amazing grip. This in combination with the accelerating tail kick gives the boards an incredible loose ride. Our unique fin angle concept has proved to beunmatched when it comes down to speed necessary for either catching waves or busting aerials. The whole range comes with an FCS plug in the nose to attach your GoPro camera. All boards come with a thruster set-up and also feature a mastfoot insert to attach awindsurf rig and are great windsurfing wave boards. Durability: The JP line is built rock solid, which is what you want in a SUP surf board! We have seen these boards take a beating in the surf and come out looking like knew! Speed: The 9’ is fast down the line, allowing us to make sections that we never would have before. Its also very maneuverable when you step back on the tail. The look pretty rad too..
One lightly used one left, come and get it!